I wandered (lonely as a cloud?) away from Fed Square along Swanston Street, then heading through the Mall, then up through Emporium, and then out onto Little Bourke Street. I’ve had a bit of success with street photos here in the past, and given that I was almost half-way through the time of day where sun was still available as a light source, I was looking for a few ‘easy’ frames to help keep things moving. This time, nothing much caught my eye. I almost took about three photos, but in the context of only 24 frames, they just didn’t seem to have enough there. But enough of what? Intrigue? Drama? No, it was story. They didn’t have enough story. They didn’t reward you for looking into the frame, imagining what it was like to be there, to see this, to imagine what happened next. 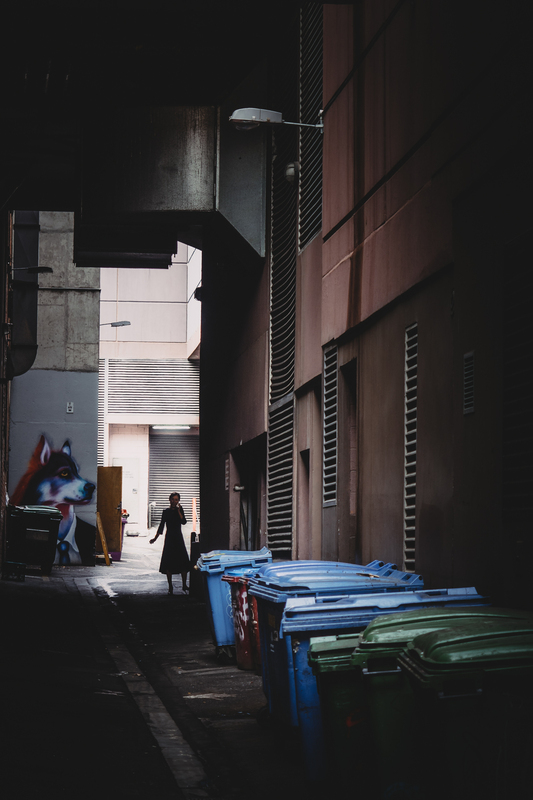 I kept meandering through such ideas as I walked, and just before leaving the area, I glanced down into this alleyway, not really expecting much. Looking at the frame now, I’m not sure how much I consciously worked through in determining that this was worth taking… now, I see the sight line of the wolf, the angle of the dress almost mirroring the hand, the silhouette positioned with the only lightness in the frame just behind, even the bins leading my eye straight to the person. Then, I just saw enough to know there was a story waiting to be told. Maybe that’s something of my craft as a photographer – to see, in that instant, the story waiting to be shared?